And I’m back with more oatmeal (porridge) recipe! This time my all time favorite combination in the form of oatmeal – Hazelnut and chocolate! 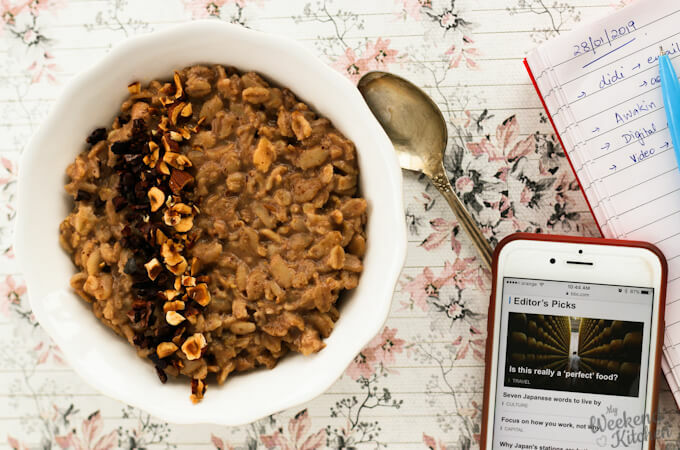 hazelnut chocolate oatmeal porridge is a delicious start to the day! Who doesn’t love the combination of hazelnut and chocolate? I no know one… do you? For the ones who haven’t tried it yet, think Nutella! yes 🙂 I love the nutty chocolatey taste of this oatmeal and it’s vegan, gluten-free, made from scratch in just 15 mins. I hope you really enjoy this simple recipe. It would make my day, if you can review it and/or leave your feedback in the comments below! 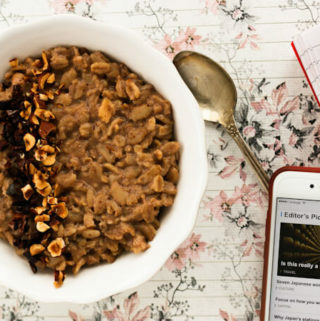 healthy, hearty, and totally delicious – this hazelnut and chocolate oatmeal is a great start to the day. Made from scratch with just 6 ingredients and ready in 20 mins. In a thick bottom pot, add oats and hazelnut milk. Bring to a boil on medium heat. Add ground hazelnut powder, vanilla extract, and cocoa powder to the pot. Mix well and let it simmer till the oats are cooked through. Stir frequently in between to allow even cooking. Mix in the maple syrup and then remove in a serving bowl. Sprinkle some chopped hazelnuts and cacao nibs on top and enjoy warm! While you can cook the oats in water, cooking them in hazelnut milk really makes them super creamy and delicious. The chopped hazelnut and cacao nibs add a crunchy bit to the smooth oatmeal and taste very nice. If you don’t have cacao nibs, add some chopped chocolate! Nutrition Information is approximate information for one serving. If you try this recipe, I would really love to know. Tag your picture with #weekendkitchen on instagram or connect with me on Facebook, Twitter, Google+, and/or Pinterest. Or join our newest journey into Recipe Videos. Thank you for the recipe Ashima! It is a delight to read your posts and try out new recipes, always made with care and a lot of context.